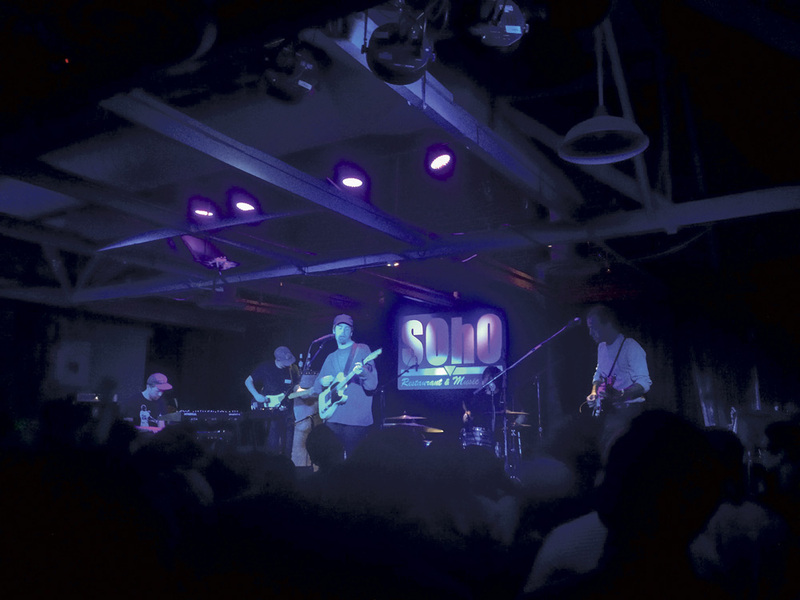 Indie dream pop band Wild Nothing returned to Santa Barbara last Tuesday night to entrance audience members at SOhO Restaurant and Music Club in the heart of downtown Santa Barbara. Wild Nothing, the solo project of Jack Tatum, blends shoegaze, post-punk, and dream pop elements to create distinctly vibrant tunes with just a hint of somberness trickling through. Although Tatum writes and records alone, during live performances he is joined on stage by bassist Jeff Haley, guitarist Nathan Goodman, drummer Max Brooks, and keyboardist Matt Kallman. Wild Nothing wasted no time with small talk, delving into their set as soon as their feet hit the stage with an eagerness that the crowd reciprocated twice-fold. Dressed in baggy t-shirts and snapbacks, there was no pretense about them whatsoever. Everything that needed communicating was done through the raw intensity of their music alone. The band drew mostly from songs off their newest album Life of Pause, but snuck in a few crowd favorites off previous albums such as Gemini. Wild Nothing is something of a paradox, to say the least. Their songs, while irrefutably catchy, do not sacrifice passion, and are more than just feel-good hits. There is an emotional depth often absent in pop music that one can clearly hear in the swelling of the synth and Jack Tatum’s soothing voice in songs such as “Alien.” Even deceptively upbeat songs such as “TV Queen” have a hint of strangeness in them that is perfectly characteristic of the band’s brand of distorted dream pop. Both their music and their performance style is energetic, without rushing towards a chorus. Instead, it’s more of an exploratory ebb and flow that uses just the right amount of repetition in order to retain its driving force. Despite a digressing, free-flowing form that sifted through a range of emotion, the show felt less like a sample platter, or a conversation between the band and the audience. Tatum sang with a sedated, dreamy tone that only faintly masked an underlying melancholy. What began as a light-hearted, repetitive pop set crafted for dancing gradually ventured into more vulnerable territory as the night progressed. Slow grooves and a prominent bassline melded beautifully with serenading vocals to create an ambience of deep reverence in “A Woman’s Wisdom.” Tatum’s languid, almost pained tribute to some unknown figure (“And I don’t believe in heaven / but, baby, you can be my church / if you let me pay you a visit / I will lay down at your feet”) captivated the crowd in spirit, while the steady rock of songs such as “To Know You” sent the entire room into a high-energy frenzy. The quintet ended their regretfully short set with the enduring crowd-favorite about the nervous excitement of teenage love, “Summer Holiday.” Even in the midst of melodies such as these, saturated with unrestrained bliss, there seemed to be an all-consuming gloom that passed over the crowd in few, haunting moments. Over the course of the show, Tatum uttered only a few words of appreciation, and a warm “I love you too” in response to one enthusiastic fan’s bold declaration. Though a man of few of words, Tatum was extensive in the passion he displayed. He and his cohorts managed to explore the murky depths of human emotion all within the breadth of one uninterrupted stream of consciousness. The band, though not adorned in excess by any means, did not hold back in terms of emotional intensity. Instead, it seemed to seep through every pore of their sound, from the rhythmic, simplistic bass lines to the pulsing synth. Despite their rather unassuming appearance, or perhaps in part because of it, Wild Nothing managed to deliver a heartfelt show that no doubt moved everyone in attendance.